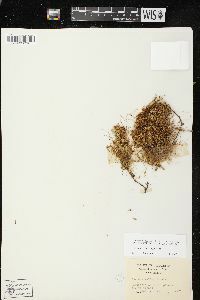 Duration: Perennial Nativity: Native Lifeform: Vine General: Perennial holoparasitic vines, stems light yellow to orange, (rarely green or red) glabrous, thread-like and forming small to large mats atop hosts, generally not in contact with the ground, attaching to the host by many small, specialized roots (haustoria) along stems. Leaves: Alternate, very small and scale-like, to 2 mm long. Flowers: Creamy white and translucent, sometimes shining and minutely sparkling, with exserted orange or yellow anthers, corollas narrowly bell-shaped (campanulate) 5-parted, 2.5-4.5 mm long, corolla tubes to 2 mm long, oblong to oblong, rounded and uniformly densely fringed, lobes ovate to lance-oblong with entire margins and acute tips, reflexed to spreading, and alternate stamens, persistent and usually withering in fruit, calyx creamy white, cylindric, to 4.5 mm long, fused at the base and divided above, lobes triangular to lanceolate but bases not overlapping, margins entire, tips acute, membraneous or fleshy, persistent, stamens with subtending scales, scales oblong, shallowly fringed, free from the corolla tube at the upper end only, filaments to 0.7 mm long, anthers orange to yellow, oval to elliptic, exserted up to 0.7 mm, ovary superior with 2 chambers, each with 2-ovules, styles 2, to 1 mm long, free and persistent, stigmas 2, spheric and persistent, flowers born in close or loose umble-like infloresences in groups of 2-16 flowers, pedicels to 5 mm long. Fruits: Elliptic-ovoid, capsule thickened, more or less enclosed by the corollas, to 2.5 mm long and 2 mm wide, tips pointed or not, not thickened or raised around opening between styles, nor translucent. 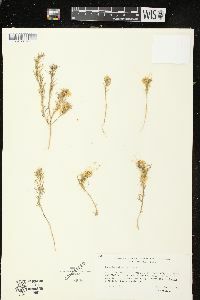 Seeds 1, widely elliptic to spheric, to 1.5 mm long and wi Ecology: Found generally on saline soils, on herbs on inland salt flats, from 150-350 ft (45-106 m); flowering May-November. 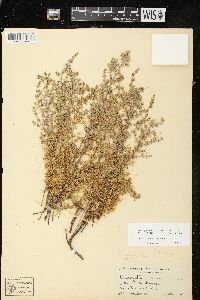 Host plants include Atriplex, Suaeda, Allenrolfea, Salsola, Nitrophila, and Cressa. 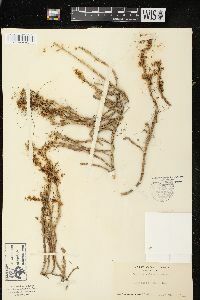 Look for this species in Arizona in Maricopa, Pinal, an Distribution: Arizona, California, New Mexico, Nevada, Oregon, Utah, Washington, and British Columbia. 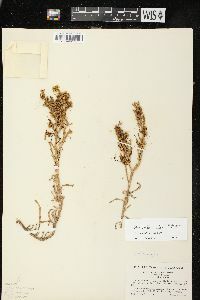 Synonyms: Cucuta californica var. squamigera, Cucuta salina var. squamigera, Cucuta squamigera, Cucuta subinclusa var. abbreviata Editor: LCrumbacher2012 Etymology: Cuscuta is a name of Arabic derivation meaning "dodder", and salina comes from the Latin sal or salis, "salt," and the -inus suffix denoting a belonging to or a resemblance to, thus salty or growing in salty places.